I usually pick one to two destinations each summer to travel to. This summer I chose Spain and spent the majority of my time there. I visited Barcelona, Ibiza, Mallorca and Valencia. I wanted to do an overall break down of my favorites in every city from food, clubs, beaches or sights to see. First up, Barcelona! I went in the beginning of summer and at the end- when I visited Barcelona at the end of summer in August I was there during the terrorist attack that occurred on Las Ramblas. I was staying at a hotel just a few minutes away, and it was a serious wakeup call to what is going on in this world, and it was the first terrorist attack in Barcelona ever. I went back the second time to Barcelona to attend a festival called Fiestas De Gracias which is a local neighborhood street festival. The different neighborhoods in Gracia decorate their streets and its a competition who has the best decorated street, the winner receiving a big cash prize. The locals go all out and the decorations are really impressive. Aside from the festive decor and colors, people are partying on the streets eating, drinking and dancing. The festival lasts a week long- I went the second night, and the energy on the streets was amazing. Everyone was celebrating and in great spirit, and the streets were jammed packed. The third night is when the terrorist attack happened so the festival got canceled. I ended up going back the following day and the festival just wasn’t the same. People still tried to come out and come together to make the best of a tragic situation but the energy was completely different. Most of the clubs, bars and restaurants in the city closed down a few days after the attack… to see such a lively city become somber and almost desolate was just plain sad. Although my last trip to Barcelona was affected by the attack, Barcelona itself is such an amazing city. It’s exciting and lively with such great energy. There is so much to do and see. 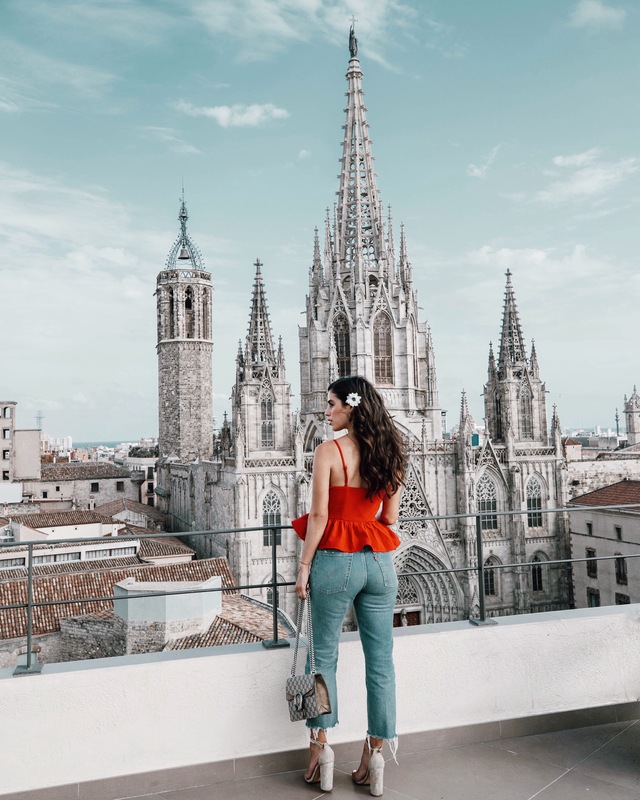 I’ve been to Barcelona four times, and below is my guide to my favorite things to hit up. If you’ve never been, it’s worth a visit. -Making Paella in a local’s backyard. I loved doing this! I had the chance of cooking paella in a local’s backyard. I booked it through AirBnB experiences, and its called La Salsamenta. The woman’s name is Sarah and she was so welcoming into her home. We got to make a seafood and meat paella, and it’s also a great way to meet other travelers! -Going to an underground Flamenco show. You got to experience a Flamenco show when in Spain! Instead of going to a grand show in a theater, I was searching for a more authentic experience. I found a show put on my a local family who runs a clothing shop in Barcelona. They put the show underground, underneath their store! When I arrived I was confused for a few minutes I was looking at a clothing store, but when I walked inside I told them I was there for a Flamenco show and they welcomed me with big smiles and said I was in the right place. I walked down these steep steps to what felt like into an underground cave, and there they put on an amazing Flamenco show. I also booked this through AirBnB experiences, and it’s called La Milagrosa Barcelona. La Boqueria- the most famous outdoor market in Barcelona. A must visit! Copyright © 2019 Nicole Isaacs.